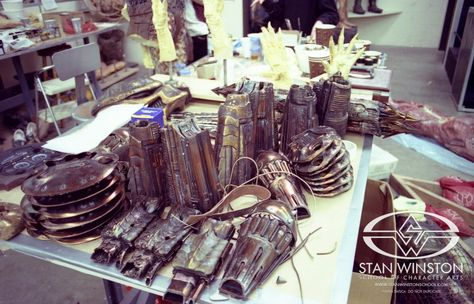 Another very interesting photograph from the Stan Winston studio. 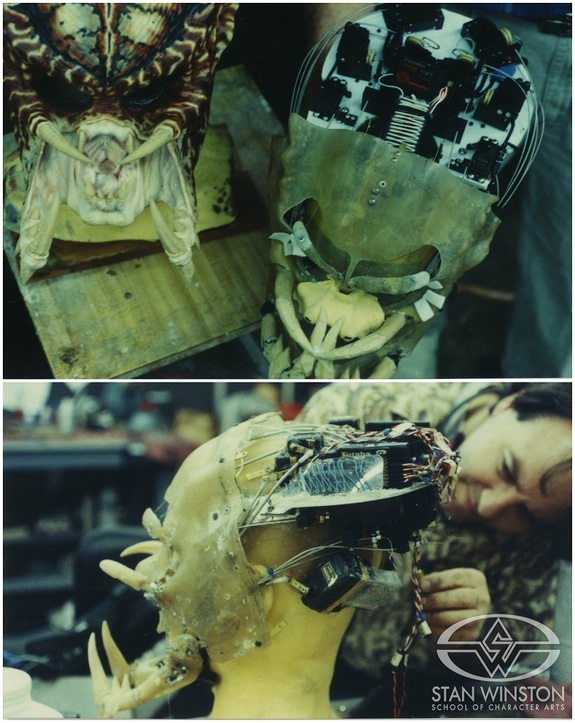 There were at least two complete animatronic heads made for Predator 2 - one used for close up shots (and with especially fine motion of the mandibles &c.) and one for less close shots. 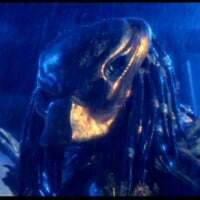 The scene just prior to Harrigan severing the Predator's arm is available freely on YouTube and beautifully shows the range and fineness of motion. If you are interested I will post other photographs here. Another fascinating photo. 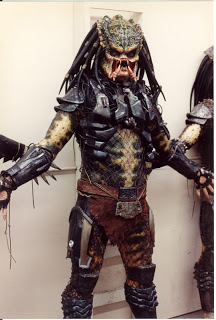 When I first began to seriously study Predator 2 I was surprised by the sheer number of duplicates of each item made -- a practice I now know to be universal in the world of film -- against damage or wear and tear. The level of artistry in keeping exquisite quality and perfect consistency (for no substitution must be noticeable) is breathtaking. Borg, one of the most unusual in appearance of the LA hunting party. The name is of course ultimately derived from cyborg but according to the Internet directly from the Borg of Star Trek fame. 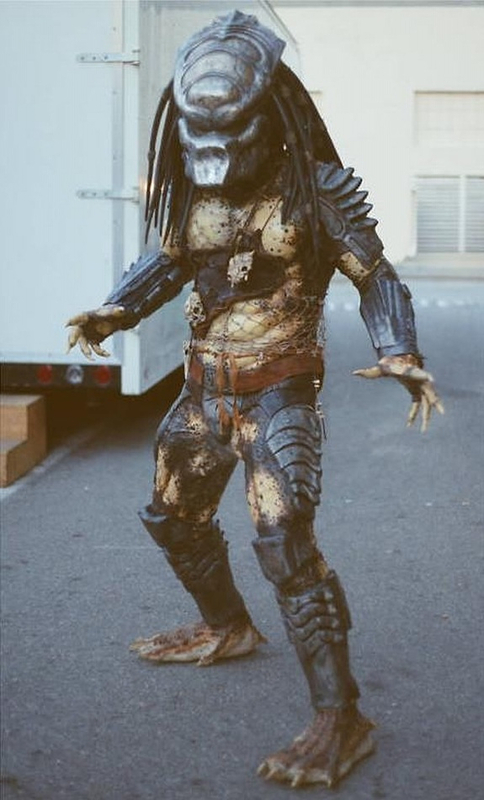 It obviously refers to the bluish metal and heavily wired and even illuminated cybernetic armour, quite unique among Predators. 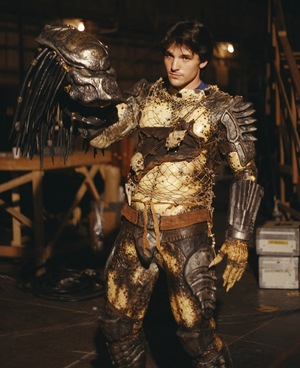 I find the armour fascinating, a tribute to the wide-ranging genius of the Stan Winston studio and the sublime quality of Predator 2 in making each of these individuals unique and distinct characters, - roving gypsies full of hip rude boy strut, a crew in the modern sense more than archaic warriors. The variation in pigmentation is brilliant, drawing from predatory snakes but damper, smooth, almost amphibian. Another member of the LA hunting party, Boar -- portrayed by Wyatt Weed, a professional actor writer & producer now in St Louis Missouri. A wiry, almost naked hunter with a tanned hide across his chest and adorned with skulls and a very distinctive biomask with an upturned 'snout'. People with an interest in Hot Toys will notice that their "Lost Predator" is obviously Borg, but has Boar's mask and Shaman's spear, complete with a hand to hold it painted as if it were Borg's as well as a spear and smart disc he never possessed - it is almost as if we are being given a kit to aid the artistic (not including me!) to start on additional Lost Hunters.